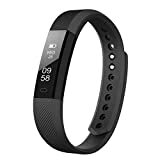 ❤Features: Bluetooth Phone Call and Message, Call Reminder, Notification Sync, Pedometer, Sleep Monitor, Sedentary Reminder, Music Player, Calendar, Anti-lost, Remote Capture, Etc. 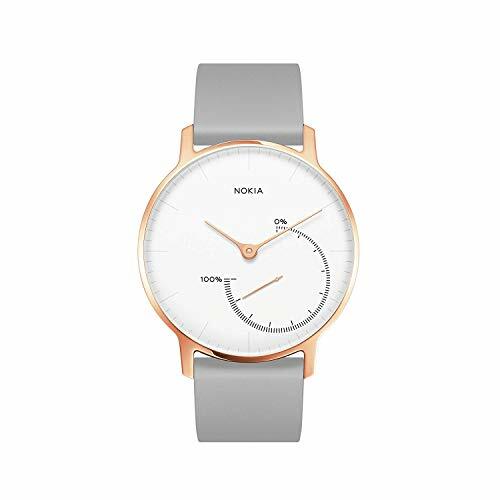 ❤Standalone Phone: If put SIM card and TF card in the watch, you can make phone calls and messages directly, can also use other apps that was pre-installed like Facebook, Twitter, WhatsApp, Broswer. ❤Compatibility: Compatible with Android & IOS smartphones, Perfect compatible with Android phone, partial available for IOS systerm. 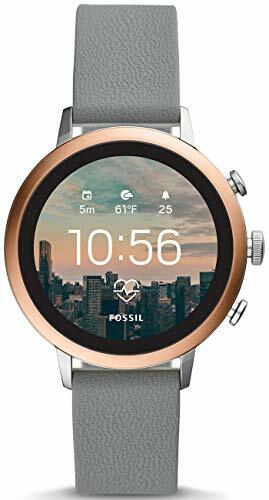 ❤Note: Iphone partial available, iOS system it can only used to make and answer calls, sync contacts, and play music via Bluetooth(APP unavailable ) not support GPS, WiFi, Video or Heart Rate Monitor. The Smart Watch of Janker Makes Your Life More Easier! Control your music with your phone's selected music player whether it's Spotify, Pandora, Soundcloud, Google Play, iTunes or Appl e Music. Image viewer, Sound recorder (need SD card); Remote capture, Alarm clock, Calendar, Calculator, Camera (0.3M); Facebook, Twitter, WhatsApp, Browser (need GSM 2G/2.5G SIM card). 2. 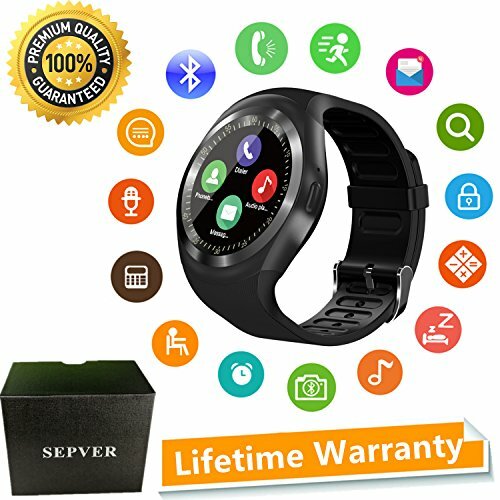 For IOS Phone, this smart watch supports answer & call, phone book, music play, camera, clock, pedometer, sleep monitoring, sedentary remind, etc. But not support SMS, remote camera control, App. And it also does not support the vibration function. 3. Package includes smart watches x1, data cable x1, manual x1, cleaning cloth x1, battery x2. 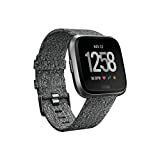 You can use this smart watch to make calls, Answer calls, send and receive text messages, sync notification, sync phone book, sync call history, play music, set alarm, count your step, monitor your sleep quality, remind you to have a drink, view image, remote control your mobile phone to take pictures, find your mobile phone etc. 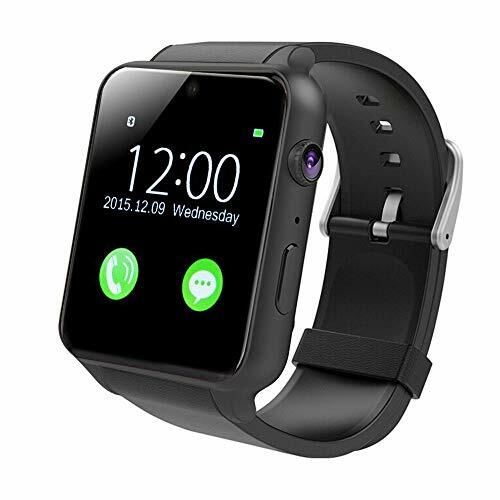 For Android phone, all features of this smart watch works. For iPhone, not support BT notifications, sync message, remote notifier, send sessage , phone book. Please note 1 : Remote notifier, Remote capture, Anti lost, need to download an Funrun App in your Android smart phone fisrt. Q2: is there an APP work for IOS phone? A2: No, there is no App work for IOS phones. Q3: I can not download the APP by scanning the QR code from the watch, what do I do? A3: Please go to Google Play store to search the Funrun App and download it. Q4: Can I make it silent or vibrate only in the meeting? A4:Yes, you can go to the "Profile" to choose "Silent" or "Meeting". 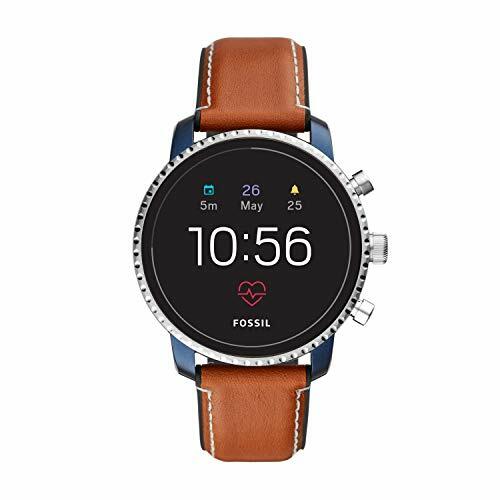 The smart watch couldn't open APP, but supports partial functions including Hands Free, Music Player, Sync Calls, Sedentary Remind, Sleep Monitor, Pedometer, Calculator, Clock and Calender. Dimensions: 2.36" x 1.57" x 0.49"
【HD Capacitive Touch Screen】:1.30 inch AMOLED Round Screen with 2.5D Radian Glass. Multiple different styles of dial interface make your watch more fashion and Outstanding. 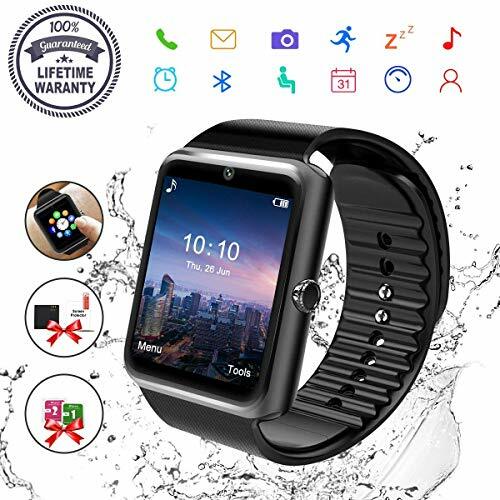 【Perfect 2-in-1 Smartwatch】:it comes with Android 5.1 OS, MTK6580 1.3Ghz Quad Core Processor, 2GB RAM + 16GB ROM, with thousands of apps at the Google Play Store. Support NANO SIM card, WIFI, 3G network. 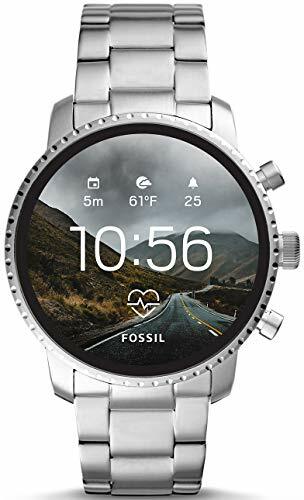 It's not only a watch, but also a phone. 【Remote Camera & Music】:6 sets of optical lenses ,high definition video chip, Equipped with 2.0MP HD camera,helps you to keeps the good memories of each exciting moment easily with high quality pictures and videos. You can also remotely control the phone camera through the Bluetooth. You can play the music in the watch memory, also you can remotely control the phone's music. 【Lifestyle Assistant】:Connect to your smart watch phone via bluetooth and bring all the features to your wrist. and directly view the message on the smart watch, also you can edit the message and send it. Including call reminder, SMS, WeChat, Twitter, Facebook and other notification reminder. After inserting the SIM card, you can use the watch to call and view the phone-book and call records directly. 【Fitness Tracker】:Real time heart rate monitoring function, You can check the accurate heart rate data at any time. 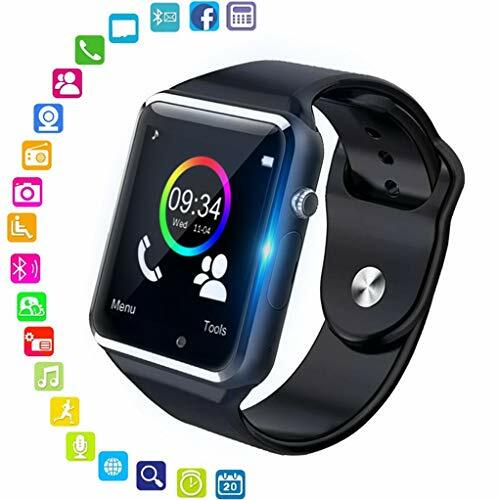 smart watch accurately records your every step, the calories energy consumption and the distance calculation. 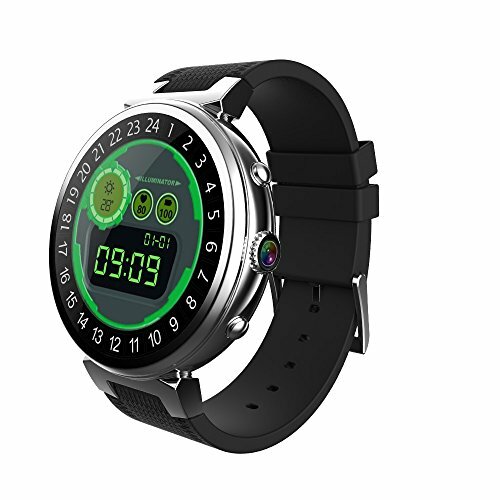 This multifunction smart watch can be used to instead of mobile phone on some occasions. With advanced Quad-core CPU, Nano SIM,large 512M / 2GB RAM & 8GB/16GB FLASH memory etc,you can use it to dial, message, listen music,take photos, and do GPS navigation etc. Large memory up to 512M/2GB RAM & 8GB/16GB FLASH. 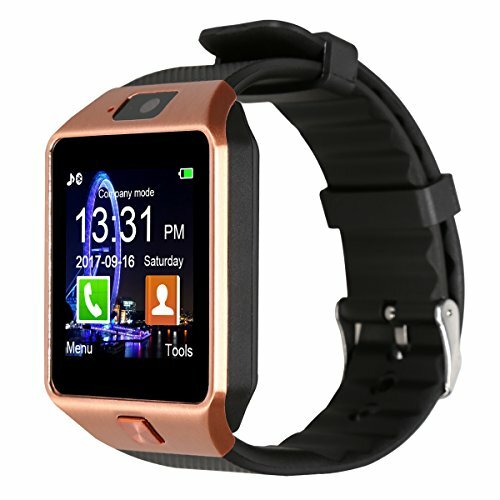 【Multi-Function smart watch】: Dial via smart watch with a SIM card or Bluetooth optional, Pedometer, Sedentary remind, Sleep monitoring, Remote photos, Music playing, Alarm clock, Two-way anti lost remind, alarm clock, voice recorder, muti-timezone, muti-language, daylight saving time and notification push including facebook,twitter, email,calls,texts,etc.For ANDROID, all functions work. For iPhone, the smartwatch supports Partial Functions. 【Wearing More Comfortable】:STAINLESS steel surface, Precision laminating process, Nano TPU85 material strap, anti-sweat matte surface treatment, ergonomic convex design and soft strap which make wearing more comfortable. Life Waterproof, the smart watch surface can resist rainwater impact when you are in outdoor. 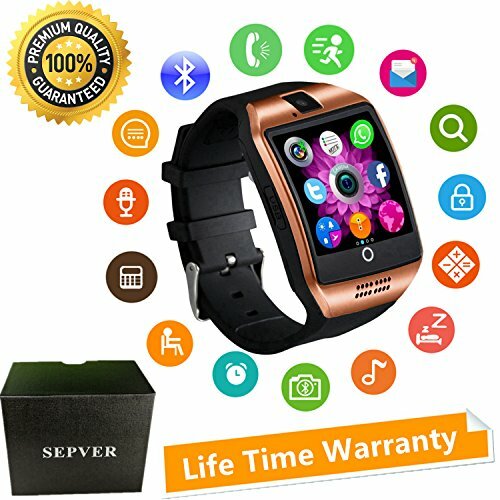 ► Multi-function smart watch : Call, SMS push, pedometer, sedentary reminder, sleep monitoring, remote acquisition, remote control camera, anti-lost, music player, calculator, alarm clock, calendar, stopwatch, muti-timezone, muti-language, daylight saving time and notification push including Facebook, twitter, email, calls, texts etc. ► Two modes of operation : One is to insert a 2G micro SIM card, a smart watch can make and receive calls, send and receive messages, Facebook, Twitter, browser, etc. as separate smartphones. Another way is to use the Bluetooth app as a Bluetooth device to implement all functions via Bluetooth. 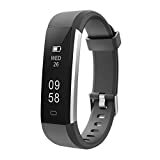 ► Health Intelligence Monitor : Pedometer, record the number of steps and calories burned every day; sedentary reminder, health reminder, relax at the appropriate time; sleep monitoring, let you know your sleep state, improve sleep quality. Be your best companion. ► High Quality: 240 * 240 resolution and 1.54 inch TFT HD liquid crystal capacitive touch screen, even in the sun, can be clearly displayed, Nano TPU85 material strap, anti-sweat matte surface treatment, ergonomic convex design and soft strap, which make wearing more comfortable. It is an ideal choice for birthday gifts, and anniversaries! ► Broad Compatibility : Fully compatible with Android smartphones and tablets, such as: Samsung, Huawei, HTC, Sony, LG, OPO, Xiaomi, etc. Some features are available for iOS. This watch supports GSM 850/900/1800/1900 MHz micro SIM card and supports up to 32 TF cards. 3. 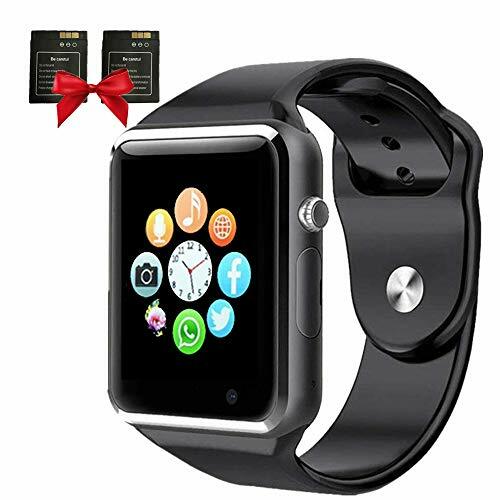 This smart watch has a SIM card slot, but the card is not included in the package! 1. Q: Is this smart watch compatible with the iPhone? A: Limited support features such as notification push, remote capture, anti-lost, and the app is currently not available for iPhone. 2. Q: Do I need to install a third-party application on my Android smartphone? A: Yes, please read the user instructions carefully. ✅WORK AS A PHONE - The smart watch supports to make or answer a phone call with SIM and TF cards. Sync contacts, call log and notification with phone to help save time while not convenient to use phone. You can talk after connecting BT without SIM card. ✅SPORT TRACKER - Record steps, distance, time and calorie burnt during running, walking, climbing, riding and hiking. Fun to play music, taking pictures or record sound and videos during your exercise. Not only a tool but also a good friend for daily life. ✅HIGH PRECISION QUALITY - 1.3in round IPS screen shows HD image and touches more sensitively. Soft light strap with buckles is non slip and comfortable. 340mAh battery support 5-day long standby time and 2 days using time. Fashion design with dual card slot for card insert in the side. 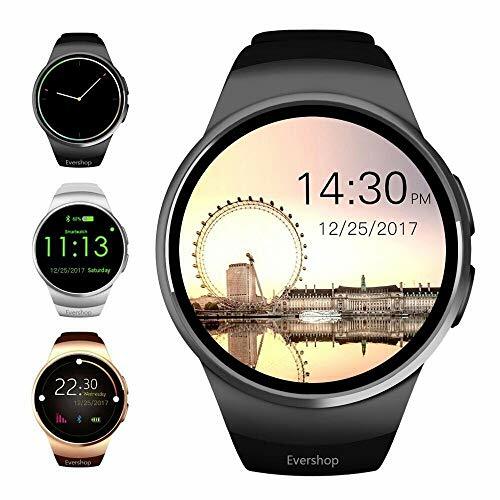 ✅WIDELY COMPATIBILY - The smart watch compatibles for the smartphones which is Android 4.4 and above, IOS 9.0 and above, with BT 4.0. Package includes 1 x Smart Watch, 1 x USB Cable and 1 x User Manual. 24-Month Warranty and lifetime customer service. NOTE: Please turn off the watch before placing the micro card. NOTE: Please turn off the watch before placing the micro card.